Enthusiasts consider EVP to be a form of paranormal phenomenon often found in recordings with static or other background noise. However, scientists regard EVP as a form of auditory pareidolia (interpreting random sounds as voices in one's own language) and a pseudoscience promulgated by popular culture. Prosaic explanations for EVP include apophenia (perceiving patterns in random information), equipment artifacts, and hoaxes. American photographer Attila von Szalay was among the first to try recording what he believed to be voices of the dead as a way to augment his investigations in photographing ghosts. He began his attempts in 1941 using a 78 rpm record, but it wasn't until 1956 — after switching to a reel-to-reel tape recorder — that he believed he was successful. Working with Raymond Bayless, von Szalay conducted a number of recording sessions with a custom-made apparatus, consisting of a microphone in an insulated cabinet connected to an external recording device and speaker. Szalay reported finding many sounds on the tape that could not be heard on the speaker at the time of recording, some of which were recorded when there was no one in the cabinet. He believed these sounds to be the voices of discarnate spirits. Among the first recordings believed to be spirit voices were such messages as "This is G! ", "Hot dog, Art! ", and "Merry Christmas and Happy New Year to you all". Von Szalay and Raymond Bayless' work was published by the Journal of the American Society for Psychical Research in 1959. Bayless later went on to co-author the 1979 book, Phone Calls From the Dead. In 1959, Swedish painter and film producer Friedrich Jürgenson was recording bird songs. Upon playing the tape later, he heard what he interpreted to be his dead father's voice and then the spirit of his deceased wife calling his name. He went on to make several more recordings, including one that he said contained a message from his late mother. Konstantin Raudive, a Latvian psychologist who had taught at the Uppsala University, Sweden and who had worked in conjunction with Jürgenson, made over 100,000 recordings which he described as being communications with discarnate people. Some of these recordings were conducted in an RF-screened laboratory and contained words Raudive said were identifiable. :352–381 In an attempt to confirm the content of his collection of recordings, Raudive invited listeners to hear and interpret them. :353, 496 He believed that the clarity of the voices heard in his recordings implied that they could not be readily explained by normal means. :352–381 Raudive published his first book, Breakthrough: An Amazing Experiment in Electronic Communication with the Dead in 1968 and it was translated into English in 1971. In 1980, William O'Neil constructed an electronic audio device called "The Spiricom". O'Neil claimed the device was built to specifications which he received psychically from George Mueller, a scientist who had died six years previously. :352–381 At a Washington, DC press conference on April 6, 1982, O'Neil stated that he was able to hold two-way conversations with spirits through the Spiricom device, and provided the design specifications to researchers for free. However, nobody is known to have replicated the results O'Neil claimed using his own Spiricom devices. O'Neil's partner, retired industrialist George Meek, attributed O'Neil's success, and the inability of others to replicate it, to O'Neil's mediumistic abilities forming part of the loop that made the system work. Another electronic device specifically constructed in an attempt to capture EVP is "Frank's Box" or the "Ghost Box", created in 2002 by EVP enthusiast Frank Sumption for supposed real-time communication with the dead. Sumption claims he received his design instructions from the spirit world. The device is described as a combination white noise generator and AM radio receiver modified to sweep back and forth through the AM band selecting split-second snippets of sound. Critics of the device say its effect is subjective and incapable of being replicated, and since it relies on radio noise, any meaningful response a user gets is purely coincidental, or simply the result of pareidolia. Paranormal researcher Ben Radford writes that Frank's Box is a "modern version of the Ouija board... also known as the 'broken radio'". In 1982, Sarah Estep founded the American Association of Electronic Voice Phenomena (AA-EVP) in Severna Park, Maryland, a nonprofit organization with the purpose of increasing awareness of EVP, and of teaching standardized methods for capturing it. Estep began her exploration of EVP in 1976, and says she has made hundreds of recordings of messages from deceased friends, relatives, and extraterrestrials whom she speculated originated from other planets or dimensions. The term Instrumental Trans-Communication (ITC) was coined by Ernst Senkowski in the 1970s to refer more generally to communication through any sort of electronic device such as tape recorders, fax machines, television sets or computers between spirits or other discarnate entities and the living. One particularly famous claimed incidence of ITC occurred when the image of EVP enthusiast Friedrich Jürgenson (whose funeral was held that day) was said to have appeared on a television in the home of a colleague, which had been purposefully tuned to a vacant channel. ITC enthusiasts also look at the TV and video camera feedback loop of the Droste effect. In 1979, parapsychologist D. Scott Rogo described an alleged paranormal phenomenon in which people report that they receive simple, brief, and usually single-occurrence telephone calls from spirits of deceased relatives, friends, or strangers. Rosemary Guiley has written "within the parapsychology establishment, Rogo was often faulted for poor scholarship, which, critics said, led to erroneous conclusions." In 1995, the parapsychologist David Fontana proposed in an article that poltergeists could haunt tape recorders. He speculated that this may have happened to the parapsychologist Maurice Grosse who investigated the Enfield Poltergeist case. However, Tom Flynn a media expert for the Committee for Skeptical Inquiry examined Fontana's article and suggested an entirely naturalistic explanation for the phenomena. According to the skeptical investigator Joe Nickell "Occasionally, especially with older tape and under humid conditions, as the tape travels it can adhere to one of the guide posts. When this happens on a deck where both supply and take-up spindles are powered, the tape continues to feed, creating a fold. It was such a loop of tape, Flynn theorizes, that threaded its way amid the works of Grosse's recorder." In 1997, Imants Barušs, of the Department of Psychology at the University of Western Ontario, conducted a series of experiments using the methods of EVP investigator Konstantin Raudive, and the work of "instrumental transcommunication researcher" Mark Macy, as a guide. A radio was tuned to an empty frequency, and over 81 sessions a total of 60 hours and 11 minutes of recordings were collected. During recordings, a person either sat in silence or attempted to make verbal contact with potential sources of EVP. Barušs stated that he did record several events that sounded like voices, but they were too few and too random to represent viable data and too open to interpretation to be described definitively as EVP. He concluded: "While we did replicate EVP in the weak sense of finding voices on audio tapes, none of the phenomena found in our study was clearly anomalous, let alone attributable to discarnate beings. Hence we have failed to replicate EVP in the strong sense." The findings were published in the Journal of Scientific Exploration in 2001, and include a literature review. In 2005, the Journal of the Society for Psychical Research published a report by paranormal investigator Alexander MacRae. MacRae conducted recording sessions using a device of his own design that generated EVP. In an attempt to demonstrate that different individuals would interpret EVP in the recordings the same way, MacRae asked seven people to compare some selections to a list of five phrases he provided, and to choose the best match. MacRae said the results of the listening panels indicated that the selections were of paranormal origin. Portable digital voice recorders are currently the technology of choice for some EVP investigators. Since some of these devices are very susceptible to Radio Frequency (RF) contamination, EVP enthusiasts sometimes try to record EVP in RF- and sound-screened rooms. Some EVP enthusiasts describe hearing the words in EVP as an ability, much like learning a new language. Skeptics suggest that the claimed instances may be misinterpretations of natural phenomena, inadvertent influence of the electronic equipment by researchers, or deliberate influencing of the researchers and the equipment by third parties. EVP and ITC are seldom researched within the scientific community, so most research in the field is carried out by amateur researchers who lack training and resources to conduct scientific research, and who are motivated by subjective notions. Paranormal claims for the origin of EVP include living humans imprinting thoughts directly on an electronic medium through psychokinesis and communication by discarnate entities such as spirits, nature energies, beings from other dimensions, or extraterrestrials. Paranormal explanations for EVP generally assume production of EVP by a communicating intelligence through means other than the typical functioning of communication technologies. Natural explanations for reported instances of EVP tend to dispute this assumption explicitly and provide explanations which do not require novel mechanisms that are not based on recognized scientific phenomena. One study, by psychologist Imants Barušs, was unable to replicate suggested paranormal origins for EVP recorded under controlled conditions. Brian Regal in Pseudoscience: A Critical Encyclopedia (2009) has written "A case can be made for the idea that many EVPs are artifacts of the recording process itself with which the operators are unfamiliar. The majority of EVPS have alternative, nonspiritual sources; anomalous ones have no clear proof they are of spiritual origin." Auditory pareidolia is a situation created when the brain incorrectly interprets random patterns as being familiar patterns. In the case of EVP it could result in an observer interpreting random noise on an audio recording as being the familiar sound of a human voice. The propensity for an apparent voice heard in white noise recordings to be in a language understood well by those researching it, rather than in an unfamiliar language, has been cited as evidence of this, and a broad class of phenomena referred to by author Joe Banks as Rorschach Audio has been described as a global explanation for all manifestations of EVP. Skeptics such as David Federlein, Chris French, Terence Hines and Michael Shermer say that EVP are usually recorded by raising the "noise floor" – the electrical noise created by all electrical devices – in order to create white noise. 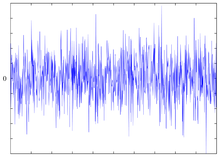 When this noise is filtered, it can be made to produce noises which sound like speech. Federlein says that this is no different from using a wah pedal on a guitar, which is a focused sweep filter which moves around the spectrum and creates open vowel sounds. This, according to Federlein, sounds exactly like some EVP. This, in combination with such things as cross modulation of radio stations or faulty ground loops can cause the impression of paranormal voices. The human brain evolved to recognize patterns, and if a person listens to enough noise the brain will detect words, even when there is no intelligent source for them. Expectation also plays an important part in making people believe they are hearing voices in random noise. Apophenia is related to, but distinct from pareidolia. Apophenia is defined as "the spontaneous finding of connections or meaning in things which are random, unconnected or meaningless", and has been put forward as a possible explanation. According to the psychologist James Alcock what people hear in EVP recordings can best be explained by apophenia, cross-modulation or expectation and wishful thinking. Alcock concluded "Electronic Voice Phenomena are the products of hope and expectation; the claims wither away under the light of scientific scrutiny." Interference, for example, is seen in certain EVP recordings, especially those recorded on devices which contain RLC circuitry. These cases represent radio signals of voices or other sounds from broadcast sources. Interference from CB Radio transmissions and wireless baby monitors, or anomalies generated through cross modulation from other electronic devices, are all documented phenomena. It is even possible for circuits to resonate without any internal power source by means of radio reception. Capture errors are anomalies created by the method used to capture audio signals, such as noise generated through the over-amplification of a signal at the point of recording. Artifacts created during attempts to boost the clarity of an existing recording might explain some EVP. Methods include re-sampling, frequency isolation, and noise reduction or enhancement, which can cause recordings to take on qualities significantly different from those that were present in the original recording. The very first EVP recordings may have originated from the use of tape recording equipment with poorly aligned erasure and recording heads, resulting in the incomplete erasure of previous audio recordings on the tape. This could allow a small percentage of previous content to be superimposed or mixed into a new 'silent' recording. For all radio transmissions above 30 MHz (which are not reflected by the ionosphere) there is a possibility of meteor reflection of the radio signal. Meteors leave a trail of ionised particles and electrons as they pass through the upper atmosphere (a process called ablation) which reflect transmission radio waves which would usually flow into space. These reflected waves are from transmitters which are below the horizon of the received meteor reflection. In Europe this means the brief scattered wave may carry a foreign voice which can interfere with radio receivers. Meteor reflected radio waves last between 0.05 seconds and 1 second, depending on the size of the meteor. There are a number of organizations dedicated to studying EVP and instrumental transcommunication, or which otherwise express interest in the subject. Individuals within these organizations may participate in investigations, author books or journal articles, deliver presentations, and hold conferences where they share experiences. In addition organizations exist which dispute the validity of the phenomena on scientific grounds. The Association TransCommunication (ATransC), formerly the American Association of Electronic Voice Phenomena (AA-EVP), and the International Ghost Hunters Society conduct ongoing investigations of EVP and ITC including collecting examples of purported EVP available over the internet. The Rorschach Audio Project, initiated by sound artist Joe Banks, which presents EVP as a product of radio interference combined with auditory pareidolia and the Interdisciplinary Laboratory for Biopsychocybernetics Research, a non-profit organization dedicated to studying anomalous phenomena related to neurophysiological conditions. According to the AA-EVP it is "the only organized group of researchers we know of specializing in the study of ITC". Parapsychologists and Spiritualists have an ongoing interest in EVP. Many Spiritualists experiment with a variety of techniques for spirit communication which they believe provide evidence of the continuation of life. According to the National Spiritualist Association of Churches, "An important modern day development in mediumship is spirit communications via an electronic device. This is most commonly known as Electronic Voice Phenomena (EVP)". An informal survey by the organization's Department Of Phenomenal Evidence cites that 1/3 of churches conduct sessions in which participants seek to communicate with spirit entities using EVP. The James Randi Educational Foundation offers a million dollars for proof that any phenomena, including EVP, are caused paranormally. The concept of EVP has influenced popular culture. It is popular as an entertaining pursuit, as in ghost hunting, and as a means of dealing with grief. It has influenced literature, radio, film, television, and music. Films involving EVP include Poltergeist, The Sixth Sense, and White Noise. It has also been featured on television series like Ghost Whisperer, The Omega Factor, A Haunting, Ghost Hunters, MonsterQuest, Ghost Adventures, The Secret Saturdays, Fact or Faked: Paranormal Files, Supernatural, Derren Brown Investigates, and Ghost Lab. Coast To Coast AM hosts George Noory and Art Bell have explored the topic of EVP with featured guests such as Brendan Cook and Barbara McBeath of the Ghost Investigators Society, and paranormal investigator and 'demonologist' Lou Gentile. The Spirit of John Lennon was a pay-per-view seance broadcast in 2006, in which TV crew members, a psychic, and an "expert in paranormal activity" claim the spirit of former Beatle John Lennon made contact with them through what was described as "an Electronic Voice Phenomenon (EVP)." The Doctor Who episode Dark Water features a fictional facility which was allegedly based on this principle. Legion, a 1983 novel by William Peter Blatty, contains a subplot where Dr. Vincent Amfortas, a terminally ill neurologist, leaves a "to-be-opened-upon-my-death" letter for Lt. Kinderman detailing his accounts of contact with the dead, including the doctor's recently deceased wife, Ann, through EVP recordings. Amfortas' character and the EVP subplot do not appear in the film version of the novel, The Exorcist III, although in Kinderman's dream dead people are seen trying to communicate with the living by radio. In Nyctivoe a 2001 vampire-inspired play by Dimitris Lyacos the male character as well as his deceased companion are speaking from a recording device amidst a static/white noise background. In With the people from the bridge, a 2014 play by Dimitris Lyacos based on the idea of the return of the dead, the voice of the female character NCTV is transmitted from a television monitor amidst a static/white noise background. EVP is the subject of Vyktoria Pratt Keating's song "Disembodied Voices on Tape" from her 2003 album Things that Fall from the Sky, produced by Andrew Giddings of Jethro Tull. Laurie Anderson's "Example #22", from her 1981 album Big Science, interposes spoken sentences and phrases in German with sung passages in English representing EVP. During the outro to "Rubber Ring" by The Smiths, a sample from an EVP recording is repeated. The phrase "You are sleeping, you do not want to believe," is a 'translation' of the 'spirit voices' from a 1970s flexitape. The original recording is from the 1971 record which accompanied Raudive's book 'Breakthrough', and which was re-issued as a flexi-disc in the 1980s free with The Unexplained magazine. Bass Communion's 2004 album Ghosts on Magnetic Tape was inspired by EVP. The band Giles Corey, founded by Dan Barrett composed a song called 'Empty Churches' which features track 2 called 'Raymond Cass', track 36 called 'Justified Theft' and track 38 called 'Tramping' from the album An Introduction to EVP by The Ghost Orchid which features excerpts from different EVP experiments produced by many researchers, although most are unknown, some have been pointed out to be more known researchers who studied EVP recordings including Friedrich Jurgenson, Raymond Cass and Konstantin Raudive. In 2017 in Poland was published music cd Katharsis (A Small Victory) of Teatr Tworzenia by Jarosław Pijarowski with background recorded used EVP recordings (second track - "Katharsis – Pandemonium"). ^ a b Raudive, Konstantin (1971). Breakthrough: An Amazing Experiment in Electronic Communication With the Dead (Original title: The Inaudible Becomes Audible). Taplinger Publishing Co. ISBN 978-0-8008-0965-2. ^ William F. Williams (2 December 2013). Encyclopedia of Pseudoscience: From Alien Abductions to Zone Therapy. Taylor & Francis. pp. 382–. ISBN 978-1-135-95529-8. Archived from the original on 29 April 2018. ^ Anderson, Nicole D. (2015). "Teaching signal detection theory with pseudoscience". Frontiers in Psychology. 6: 762. doi:10.3389/fpsyg.2015.00762. PMC 4452803. PMID 26089813. ^ Nees, Michael A.; Phillips, Charlotte (2014). "Auditory Pareidolia: Effects of Contextual Priming on Perceptions of Purportedly Paranormal and Ambiguous Auditory Stimuli". Applied Cognitive Psychology. 29: 129–134. doi:10.1002/acp.3068. ^ a b c d e Fontana, David (2005). Is There an Afterlife: A Comprehensive Review of the Evidence. Hants, UK: O Books. ISBN 978-1-903816-90-5. ^ a b c d e Senkowski, Ernst (1995). "Analysis of Anomalous Audio and Video Recordings, presented before the "Society For Scientific Exploration" USA – June 1995". Archived from the original on 2007-10-13. Retrieved 2007-09-18. ^ a b Brune, Francois (1988). The Dead Speak To Us. Philippe Lebaud. ISBN 978-2-253-05123-7. ^ a b Cardoso, Anabela (2003). ITC Voices: Contact with Another Reality?. ParaDocs. ^ Bander, Peter (1973). Voices from the tapes: Recordings from the other world. Drake Publishers. ASIN B0006CCBAE. ^ "Homepage WorldITC". Archived from the original on 2007-09-12. Retrieved 2007-09-20. Under researchers results - Konstantin Raudive. ^ "Electronic Voice Phenomena". Winter Steel. Archived from the original on 2007-09-19. Retrieved 2007-09-20. ^ Meek, George W. "An electromagnetic-etheric systems approach to communications with other levels of human consciousness". Archived from the original on 2011-06-29. Retrieved 2007-09-20. ^ Meek, George W (1988). "Report from Europe: Earthside instrumental communications with higher planes of existence via telephone and computer are now a reality". Unlimited Horizons, Metascience Foundation Inc. 6 (1): 1–11. ^ Stollznow, Karen (January 28, 2010). "Frank's Box: The Broken Radio". The Committee For Skeptical Inquiry. Archived from the original on 26 July 2010. Retrieved 13 September 2010. ^ Radford, Ben (2017). Investigating Ghosts: The Scientific Search for Spirits. Corrales, New Mexico: Rhombus Publishing Company. p. 115. ISBN 978-0-936455-16-7. ^ "Association TransCommunication (Previously known as the AA-EVP)". atransc.org. Archived from the original on 24 April 2013. Retrieved 23 April 2013. ^ Robert Carroll (11 January 2011). The Skeptic's Dictionary: A Collection of Strange Beliefs, Amusing Deceptions, and Dangerous Delusions. John Wiley & Sons. ISBN 978-1-118-04563-3. Retrieved 22 April 2013. ^ Cardoso, Anabela (2003) "ITC Voices: Contact with Another Reality?" ^ " "Claus Schreiber, Germany". World ITC. Retrieved 2007-09-21. ^ Carroll, Robert Todd. "Skeptic's Dictionary on instrumental transcommunication (ITC)". Archived from the original on 2007-10-30. Retrieved 2007-09-22. ^ Rogo, D. Scott; Bayless, Raymond (1979). Phone Calls from the Dead. New York: Prentice Hall. ISBN 978-0-13-664334-0. ^ "The Haunted Tape Recorder - CSI". www.csicop.org. Archived from the original on 2015-01-09. ^ MacRae, Alexander. "A Bio-electromagnetic Device of Unusual Properties". www.skyelab.co.uk. Archived from the original on 2007-09-29. Retrieved 2007-03-27. ^ MacRae, Alexander (October 2005). "Report of an Electronic Voice Phenomenon Experiment inside a Double-Screened Room". Journal of the Society for Psychical Research. ^ Feola, José (2000-07-01). "The Alpha Mystery". FATE Magazine. Archived from the original on 2007-07-01. Retrieved 2007-09-22. ^ Chisholm, Judith (2000). "A Short History of EVP". Psychic World. Archived from the original on 2007-02-11. Retrieved 2006-12-03. ^ Konstantinos (2001-02-01). "You can Hear Dead People". Fate. Archived from the original on 2007-09-28. Retrieved 2007-09-21. ^ Jahn, Robert G.; Dunne, Brenda J. (1987). Margins of Reality: The Role of Consciousness in the Physical World. San Diego, California: Harcourt Brace Jovanovich. ISBN 978-0-15-157148-2. ^ "EVPs - Questions & Answers". www.friendly-ghosts.com. Archived from the original on 2008-05-17. ^ Josh Bosack, Josh (October 26, 2004). "Group analyzes paranormal activity". The Collegian. ^ a b c d e f g "EVP". Skeptic's Dictionary. Archived from the original on 2006-11-30. Retrieved 2006-12-01. ^ Zusne, Leonard; Warren H. Jones (1989). Anomalistic Psychology: A Study of Magical Thinking. Lawrence Erlbaum Associates. p. 78. ISBN 978-0-8058-0508-6. Retrieved 2007-04-06. ^ Shermer, Michael (May 2005). "Turn Me On, Dead Man: What do the Beatles, the Virgin Mary, Jesus, Patricia Arquette and Michael Keaton all have in common?". Scientific American. 292 (5): 37. doi:10.1038/scientificamerican0505-37. Archived from the original on 2011-03-19. ^ Shermer, Michael (May 2005). "Turn Me On, Dead Man". Scientific American. Archived from the original on 2007-10-07. Retrieved 2007-02-28. ^ Williams, Huw (2005-01-06). "'Ghostly' chatter - fact or fiction?". BBC News. Archived from the original on 2010-11-15. Retrieved 2007-09-23. ^ Hines, Terence (2003). Pseudoscience and the Paranormal. Prometheus Books. p. 111. ISBN 978-1-57392-979-0. "If one expects to hear voices, constructive perception will produce voices. The voices, not surprisingly, are usually described as speaking in hoarse whispers. The Indians used to believe that the dead spoke as the wind swirled through the trees. The tape recorder has simply brought this illusion into a technological age." ^ " "Definition of Apophenia". MedicineNet. Archived from the original on 2007-09-27. Retrieved 2007-09-23. ^ Phaedra (2006). "Believing is seeing". The Skeptic Express. Archived from the original on 2007-09-28. Retrieved 2007-03-08. ^ James Alcock. (2004). "Electronic Voice Phenomena: Voices of the Dead?" Archived 2014-04-18 at the Wayback Machine. Csicop.org. Retrieved 2014-07-12. ^ a b Paul Tipler (2004). Physics for Scientists and Engineers: Electricity, Magnetism, Light, and Elementary Modern Physics (5th ed.). W. H. Freeman. ISBN 978-0-7167-0810-0. ^ "More Past SOS Articles coming... -". www.soundonsound.com. Archived from the original on 2012-09-25. ^ A.B.C. Lovell (1954). Meteor Astronomy. Clarendon Press. ^ "2006 AA-EVP Conference - ATransC". 14 September 2016. Archived from the original on 9 August 2014. ^ "AA-EVP:Electronic Voice Phenomena and Instrumental TransCommunication". Retrieved 2007-09-22. ^ Dave and Sharon Oester. "International Ghost Hunters Society". Archived from the original on 2007-09-28. Retrieved 2007-09-22. ^ Banks, Joe (2001). "Rorschach Audio: Ghost Voices and Perceptual Creativity". Leonardo Music Journal. 11: 77–83. doi:10.1162/09611210152780728. ^ Banks, Joe (2004). "Rorschach Audio: Art and Illusion for Sound". Strange Attractor Journal 1: 124–159. ^ "Interdisciplinary Laboratory for Biopsychocybernetics Research Who we are". Archived from the original on 2007-09-30. Retrieved 2007-09-22. ^ "About The Campaign for Philosophical Freedom". Archived from the original on 2007-09-22. Retrieved 2007-09-22. ^ "NSAC - Spiritualism". Archived from the original on 2007-10-13. Retrieved 2007-09-22. ^ "Phenomenal Evidence Department of the National Spiritualist Association of Churches Concepts Involved in Spiritualism". Archived from the original on 2007-08-31. Retrieved 2007-09-22. ^ " "About the NSAC Churches". National Spiritualist Association of Churches. 2005-11-29. Archived from the original on 2007-09-28. Retrieved 2007-09-21. ^ a b Schlesinger, Victoria (2005-03-10). "Ghost hunters in search of the paranormal". AZCentral.com. Retrieved 2007-09-21. ^ " Appleton, Roy (2006-10-28). "Paranormal investigators not afraid to scare up some ghosts". The Dallas Morning News. Archived from the original on 2007-09-30. Retrieved 2007-09-21. ^ " "Long awaited movie White Noise - A major disappointment". Lone Star Spirits.com. Spring 2005. Archived from the original on 2007-09-20. Retrieved 2007-09-19. ^ "Ghost Hunters Episodes". SciFi.com. Archived from the original on 2007-07-17. Retrieved 2007-09-19. ^ Noory, George (2006-04-02). "Demonology & EVPs". Coast to Coast AM. Archived from the original on 2007-09-30. Retrieved 2007-09-19. ^ Bell, Art (2006-04-15). "Recorded Spirit Communications". Coast to Coast AM. Archived from the original on 2007-09-30. Retrieved 2007-09-19. ^ "TV psychics claim Lennon contact". BBC News. 2006-04-25. Archived from the original on 2006-06-22. Retrieved 2007-09-19. This page was last edited on 9 April 2019, at 05:12 (UTC).